Iran alleges the U.S. tried to force an Iranian scientist to disclose information about Iran's nuclear program. Washington (CNN) -- A missing Iranian researcher, who Tehran claimed the CIA abducted, has sought sanctuary in the Pakistani Embassy in Washington, a senior U.S. official and two senior Pakistani diplomatic sources told CNN on Tuesday. "Iranian scientist Shahram Amiri, who was kidnapped by the Americans, had gone to the Pakistani Embassy in Washington, D.C. and taken refuge at Iran's Interest Section. He has requested to be sent back to Iran quickly," Iran's semi-official news agency Mehr said Tuesday. Since he is an Iranian national, the Interest Section will prepare his papers, buy him a ticket and send him home, the Pakistani sources said. Secretary of State Hillary Clinton said Tuesday that Amiri is in the United States "of his own free will" and is "free to go" back to Iran. She also repeated the U.S. request that Iran release three American hikers jailed there. Amiri told the United States of his plans to return to Iran, and he was scheduled to travel Monday but was unable to make the appropriate travel arrangements in time, State Department spokesman P.J. Crowley said. Responding to a question about a potential "prisoner swap," Crowley said the United States remains concerned about three American hikers being held against their will in Iran and Robert Levinson, the former FBI agent who disappeared in Iran two years ago. But he denied any suggestion of a swap. Last week, the United States returned 10 alleged spies to Russia in exchange for four people who had been jailed in Russia. Abdul Basit, a spokesman for the Pakistani Ministry of Foreign Affairs, said that Amiri came to the embassy at 6:30 p.m. Monday. The Pakistani diplomatic sources said no one in Iran was aware of Amiri's whereabouts until his arrival at the embassy. Because Iran and the United States do not maintain diplomatic ties, the Pakistani Embassy looks after Iran's interest in Washington. Iran's Interest Section is in a separate building on the grounds of the embassy. Basit said it is controlled and staffed by Iran -- with about 70 to 80 Iranian diplomats. Pakistan has no control over the section, Basit said, adding that Amiri was not a guest of, nor was he in the custody or protection of the Pakistani government. Amiri, a researcher at Tehran's Malek Ashtar University, mysteriously disappeared in June 2009 while on a religious pilgrimage to Saudi Arabia, according to Iranian media reports. Iran has accused the United States of involvement in Amiri's disappearance, saying the researcher was taken to force him to give up data about Tehran's nuclear program. But the Pakistani sources said Amiri is not considered a top scientist in Iran and would not be privy to highly sensitive information, so his alleged captors apparently concluded he offered little use to them. The U.S. State Department has denied involvement but has been tight-lipped on whether Amiri defected and per policy, the CIA does not comment on defections. But a U.S. official who is not authorized to speak publicly said Amiri's actions show the reality of the situation. "His multiple videos and now his trip to the Iranian Interests section -- clearly prove he was not held in the United States against his will," said the U.S. official. "He came to this country freely, he lived here freely, and he has chosen freely to return to Iran. The United States, to be sure, isn't standing in his way. He himself gives the lie to the idea he was tortured or imprisoned. He can tell any story he wants -- but that won't make it true." The U.S. official also said that Amiri "may well be feeling some pressure from back home. ... That could be one explanation for his contradictory messages. That said, he's decided of his own volition to go back, and the U.S. won't stop him. He's been a free man here, and that includes the freedom to make his own choices." On Sunday, Iranian media quoted a top Iranian lawmaker as saying that newly found documents back up Tehran's claims that the CIA is responsible. "The U.S. move to kidnap Amiri runs counter to international regulations," said Javad Jahangirzadeh, a member of Iranian parliament's National Security and Foreign Policy Commission, the semi-official Fars news agency reported. He said Iranian officials had turned over the documents to the Swiss ambassador in Tehran. Last month, two videos surfaced on the internet of a man claiming to be Amiri in which he said he had escaped from U.S. agents and was hiding in Virginia. That was the third time that videos allegedly showing Amiri had circulated on the internet. In one, he said he had been kidnapped by U.S. agents. Another contradicted that claim and said he was living freely and studying in Arizona. In one of the videos posted June 30 on YouTube and dated June 14, the man again said that he was brought against his will to the United States and fears he will be discovered and re-arrested. "I am Shahram Amiri, the son of the Islamic Republic of Iran, who with God's help succeeded in running away from the U.S. security agents in the state of Virginia. I am [temporarily] at a safe place and I am trying to do this video but it is quite possible that I may shortly be again arrested by American security agents." He went on to say: "I am not free here and not allowed to contact my family or other people. If I face any problems or if I do not return to my country soon, the government of the U.S. would be directly responsible for it." CNN could not independently verify the authenticity of the videos nor the identity of the man in them. "If he is who people think he is, the U.S. would be in contact with the person," a CIA official said last month. And if he were being held against his will, "how would he have been able to produce any of the videos?" the official asked. In the second video that surfaced June 30 and dated June 23, the man claiming to be Amiri reassures his family about his well-being. "I want to let my beloved family know that I am OK and they should not worry about my health," he says. "With God's help I shall return to my beloved country in the next few days. I want them to be, as always, strong and patient and to pray for my safe return. I hope to see you in our beloved country." Tehran blamed Washington for Amiri's disappearance shortly after revelations surfaced that Iran has been building a second uranium enrichment facility near the city of Qom. After that, tensions over Iran's nuclear program mounted. 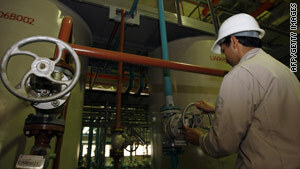 Iran says its nuclear energy is solely for civilian purposes. But the United States pushed the United Nations to punish Tehran for its nuclear ambitions. The Security Council recently slapped a fourth round of tough sanctions on the Islamic republic. CNN's Pam Benson, Shirzad Bozorgmehr and Elise Labott contributed to this report.